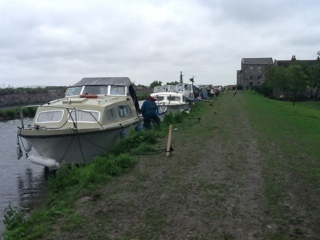 At this point in 1927 John Roche wrote "The genial dockmaster took us in charge, gave us fatherly advice touching the hitherto unexplored regions (for us) beyond Kilcock, and even as far asBallynacarrigy, which is somewhere between Westmeath and Longford, and wished us good luck as we headed for the highlands of Upper Drumcondra." This is obviously an indication of the several double locks we are about to encounter to raise us to this higher suburban lands that once homed people in a community much old than this lower Viking origined Dublin City. We awoke to a stormy morning, a continuation of the heavy rain and strong wind gusts that we went to sleep to last night. 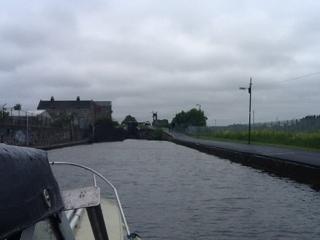 The forecast tells us that this roughish weather will be followed by cooler drier weather through this evening and through Monday and Tuesday as we pace ourselves through the many locks that raise the Royal Canal from Dublin to Maynooth. 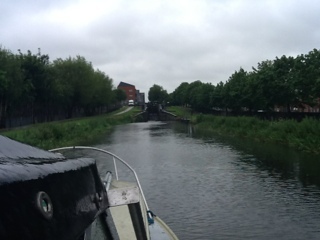 8:00 am, as told last night we were promptly disturbed from our breakfast and told to take our positions for travelling under the raised railway bridge and into the double lock just beyond it. 8:20 am, we were in position, and back enjoying our breakfast. 8:40 am, and we hear the first of the boats are going under the railway bridge that is now raised and into the first double lock. 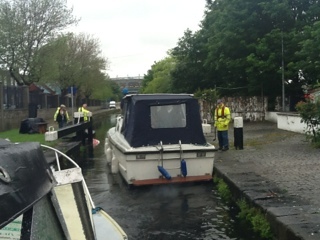 We still wait our turn in the precession of 5 double locks over the next mile or so, one boat at a time. 12:40 pm arrived and went into lock 4 and came out at 1 pm. 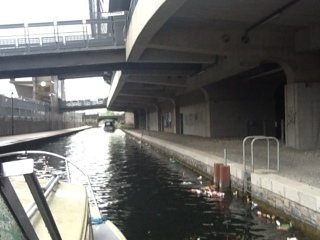 Our our way to this lock we were already passing boats with fouled props or with other problems. After our experiences of passed days, we did feel for these people, but there was plenty of help for them on hand. 2:05 pm arrived at lock 6, and straight in we went, no hold up here. There were not many people around to greet us as we passed, I assume because of the rain. John Roche wrote, of these first locks out of Dublin "I will not dwell on the excited crowds at the locks and bridges through the city. The captain. heavily disguised in a battered old soft hat, believes he escaped recognition". 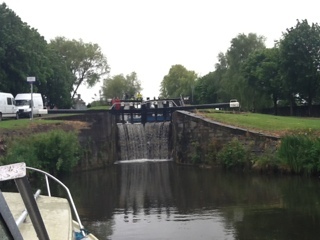 2:30 pm we had passed through the 6th lock, the last of a series of double locks that rises us up from the Liffey in Dublin to Upper Drumcondra, as John Roche calls this. Its actually Glasnevin and quite close to its famous cemetery. This was once the land of what was once one of the largest monastic communities in Erin, set up a long time before Vikings founded Dublin. Today, roads around here honour this as Columcille did spend a fair time here as a monk and had just moved back to Donegal, it is said, before plague wiped out the entrie community. Today, many of the street names here honour the old monastic presence such as Iona Road, Brigid Street, and several others. 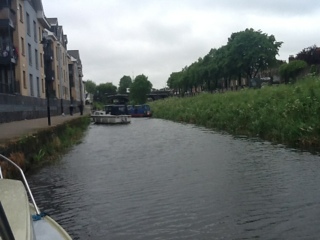 We moored along the bank beyond the lock. The lengthening line of the flotilla of heritage barges and modernish cruisers looked very dramatic and drew interest of many families who came over to look and chat. The pirate ship, as we now call it, the vintage barge made to look a bit piratish, and crew to match, received the most attention. 3:30 pm, we headed off to the Botanic House pub in Glasnevin that I had been to before and had a lovely meal at a good price. Again they did not disappoint. This is a semi modern place, well sort of 70s style, not a traditional pub but its comfortable, staff are the best and food excellent. I now regret not taking a photo before chomping in as their presentations is excellent and imaginative. Claire was thrilled to have somewhere warm and dry to enjoy a good Sunday paper reading session. Well done to the two of you! I am finally caught-up with your adventure! :-) Hoping the weather will turn for the better! 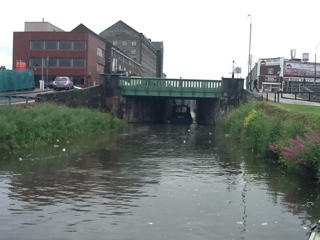 ...at least you got to the railway bridge for the opening. Even with all the prop debris!